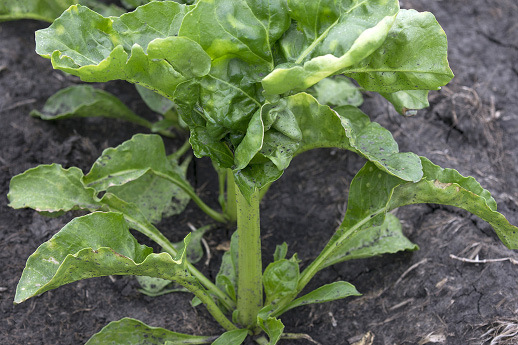 Photo courtesy of Darrol Ike, Delano, Minn.
Sugar beet is one of several crops within Beta vulgaris. Sugar beet has evolved through time from a labor-intensive agricultural crop with static yield to one that is highly mechanized and with steadily improving yield. Weeds have been a significant production challenge in sugar beet since the crop first was cultivated in Europe in the late 1700s. 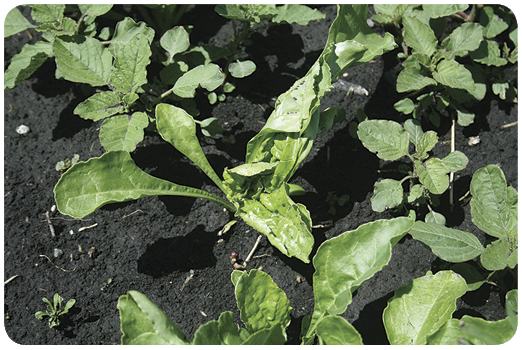 Interference from uncontrolled weeds can suppress sugar beet so severely that no crop is produced. Weeds that emerge within the first eight weeks after planting especially influence sugar beet yield. 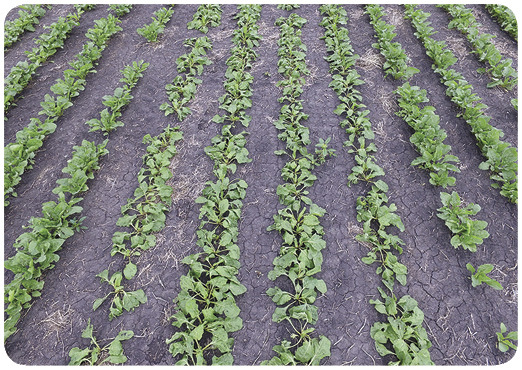 Herbicides are applied alone or in mixtures before planting (preplant), immediately after planting (pre-emergence), after sugar beet has emerged but before weeds have emerged (lay-by), and after sugar beet and weed emergence (postemergence). 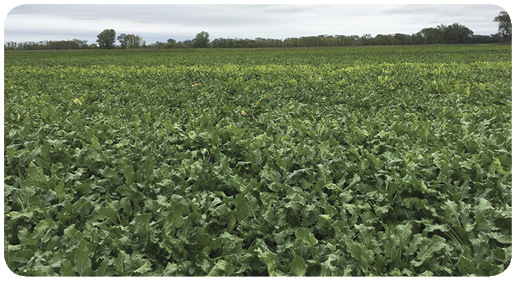 Injury can occur from herbicides applied to sugar beet for weed control, and from off-target movement of herbicides applied to other crops in adjacent fields or herbicide applied in previous years’ crops that carry over to sugar beet. Alan G. Dexter, Extension sugar beet specialist (1969-2007), Department of Plant Sciences, North Dakota State University and the University of Minnesota, authored a technical publication describing herbicide mode of action and resultant sugar beet injury symptoms in 1994. Modest development of new herbicide families has occurred since 1994. 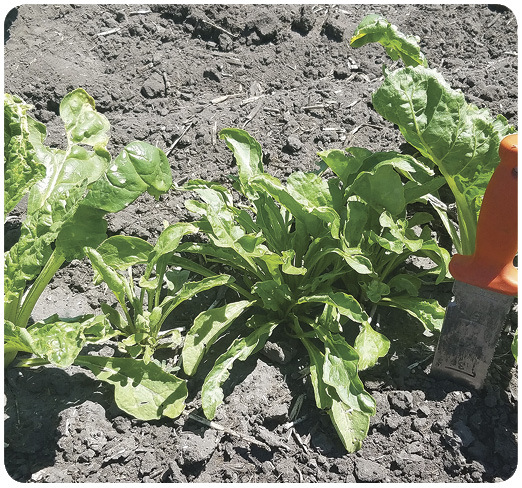 This updated publication was developed to articulate our current understanding of herbicides and how they may injure sugar beet. The application method, whether preplant incorporated, pre-emergence or postemergence, largely determines when the herbicide will contact plants and the portion of the plant contacted. Herbicide mode of action refers to how herbicides work and is the sequence of events beginning with herbicide contact and plant absorption until plant death. 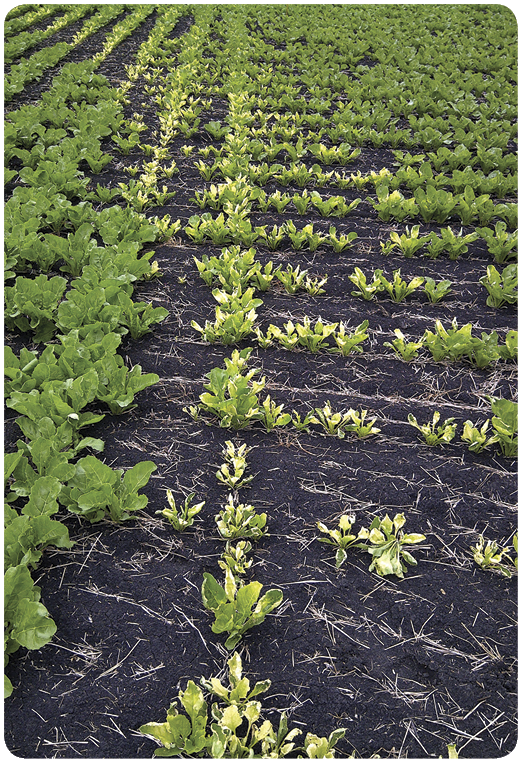 Herbicides with the same mode of action will have similar translocation patterns and produce similar injury symptoms. 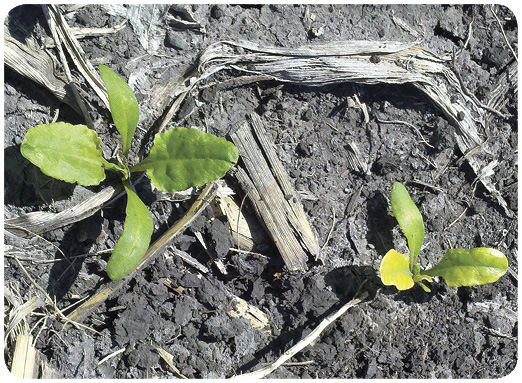 Mode of herbicide action may determine the application method needed for best results. For example, herbicides that affect protein synthesis but have little soil residual, such as clopyralid (Stinger) or glyphosate (Roundup PowerMax), need to be applied postemergence and be in contact with leaf tissue. Seedling growth inhibitors such as S-metolachlor (Dual Magnum) or cycloate (Ro-Neet SB) need to be applied to the soil to control newly germinating seedlings effectively. The potential for a herbicide to kill certain plants without injuring others is called selectivity. Plants may degrade rapidly or deactivate a herbicide to escape that herbicide’s toxic effects. For example, corn quickly deactivates atrazine by binding to naturally occurring plant chemicals. Soybean tolerance to metribuzin (Sencor/Dimetric) is at least partially due to the deactivation of the herbicide by conjugation (binding) to plant sugar molecules. Desmedipham plus phenmedipham (Betamix) applied postemergence provides pigweed spp. control in sugar beet. 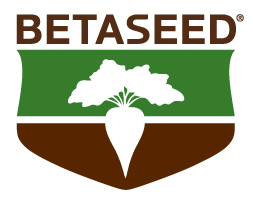 Sugar beet avoids injury from Betamix partially through its rapid metabolism. Situations may occur in which a crop is injured by a herbicide that normally is not toxic to the crop. This often occurs because environmental stressors such as hot or cold temperatures, high relative humidity or hail decrease a plant’s natural ability to reduce herbicide uptake or deactivate a herbicide. 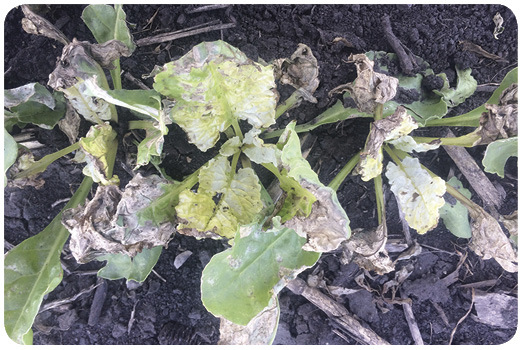 Postemergence Betamix injury to sugar beet under hot and wet weather conditions is a good example of environmentally induced herbicide injury. 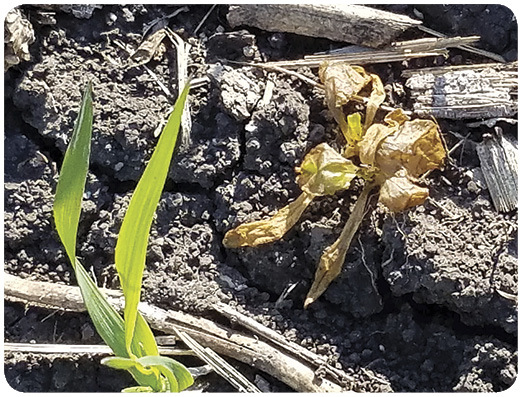 An excessive amount of herbicide due to misapplication also can injure a tolerant crop by overwhelming the crop’s herbicide degradation and deactivation systems. Seeds of many weed species are quite small and germinate only 0.5 to 1 inch below the soil surface, so soil-applied herbicides should be concentrated in the top 1 to 2 inches of soil for best weed control. 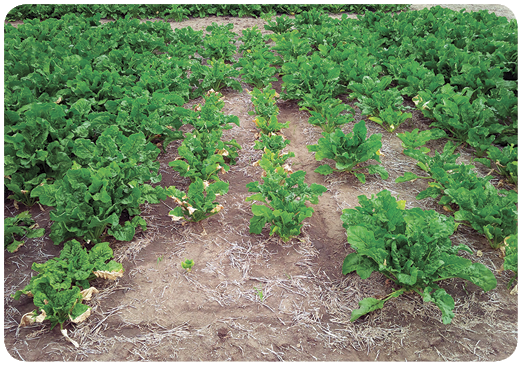 Herbicide positioning can be accomplished by mechanical incorporation or precipitation. Close contact between the herbicide and the plant is needed for absorption through the roots or shoots for effective weed control. Herbicide absorption through roots will continue if the absorbing region near the root tips remains in contact with the herbicide-treated soil. Herbicide uptake declines as the roots grow deeper. Therefore, plants may survive if the root tips grow beyond the herbicide-treated soil before herbicide absorption is sufficient to kill the plants. 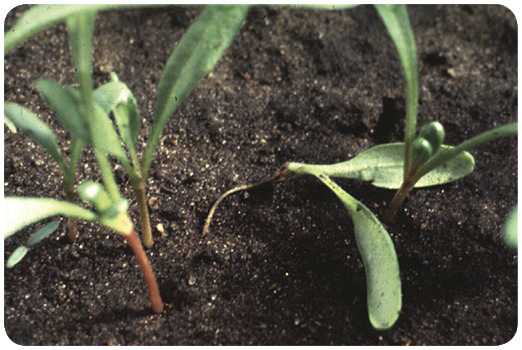 Many soil-applied herbicides are absorbed through unemerged plant shoots, and plants may be killed or injured before emergence. Volatile herbicides such as the thiocarbamates (cycloate [Ro-Neet SB], for example) or dinitroanilines such as trifluralin (Treflan) can move in the soil and penetrate plant shoots as gasses or liquids. Less volatile herbicides such as the chloroacetamides, for example, S-metolachlor, dimethenamid-P (Outlook) or acetochlor (Warrant), are absorbed into the shoots only as liquids. Physical and environmental factors that promote rapid crop emergence reduce the length of time that a plant is in contact with a soil-applied herbicide and, therefore, reduce the possibility of crop injury. Herbicides differ in translocation within a plant. The soil-applied dinitroaniline herbicides (such as trifluralin) are not mobile within the plant. Therefore, their primary injury symptoms mostly are confined to the site of uptake. Other herbicides are mobile within the plant, and injury symptoms generally will be most prominent at the site where mobile herbicides concentrate. For example, soil-applied atrazine is absorbed by plant roots and moves upward within the water transport system of the plant to the leaves, where symptoms occur. Effective weed control from postemergence herbicides depends on adequate contact with above-ground plant shoots and leaves. Therefore, proper spray nozzle selection and the correct combination of spray nozzle pressure, spray volume and ground speed should be selected to optimize droplet size, plant coverage, retention and loss due to off-target movement. Droplet size has minimal influence on weed control from readily translocated herbicides. That is, extremely course or ultracoarse spray droplets may provide less coverage, compared with a smaller droplet spectrum, but control between droplet spectrums should be equivalent. Small spray droplets applied at high spray volume provide complete leaf coverage and are retained more than large droplets on hard-to-wet leaves such as vertical, waxy or small leaves. Small spray droplets uniformly covering the leaf surface provide better efficacy from contact herbicides than larger droplets or smaller droplets with insufficient leaf surface coverage. Large spray droplets will better penetrate a spray canopy and drift less than small droplets. Droplet size is increased by reducing spray pressure, increasing nozzle orifice size, special drift reduction nozzles, adjuvants that increase spray viscosity and rearward nozzle orientation on aircraft. The postemergence herbicide rate of uptake and amount absorbed often are determined by chemical and physical relationships between the leaf surface and the herbicide. Factors such as plant size and age, water stress, air temperature, relative humidity and adjuvants can influence the rate and amount of herbicide uptake. Adjuvants such as petroleum oil concentrates or methylated seed oils, nonionic surfactants or liquid fertilizer solutions can increase a plant’s herbicide uptake. Hot and dry conditions, mature weeds and weeds growing under drought stress all can reduce herbicide uptake. The amount and rate of herbicide uptake influences the potential for crop injury and weed control, and often explains year-to-year variation in the effectiveness of herbicides. Also, rapid herbicide absorption by plants will reduce the time that rain or sunlight degradation can remove the herbicide. Postemergence herbicides, like soil-applied herbicides, differ in their movement within a plant. For adequate weed control, nonmobile postemergence herbicides must cover plants thoroughly. Nonmobile herbicides often are called contact herbicides and include the bipyridylium, diphenyl-ether, benzothiadiazole and nitrile families. Other herbicides are mobile within the plant and can move from the site of application to their site of herbicidal activity. For example, growth regulator herbicides such as 2,4-D and dicamba generally move upward and downward with the food transport system to the growing points of the shoots and roots. In general, injury symptoms will be most prominent at the sites where mobile herbicides accumulate. Herbicide resistance is defined by the Weed Science Society of America as “the inherited ability of a plant to survive and reproduce following exposure to a dose of herbicide normally lethal to the wild type. In a plant, resistance may be naturally occurring or induced by such techniques as genetic engineering or selection of variants produced by tissue culture or mutagenesis.” Plants not controlled by herbicides before any selection pressure or genetic manipulation would be considered naturally tolerant but not herbicide resistant. Resistant weeds usually are selected from the existing field population through repeated treatment over time with a given herbicide or herbicides having the same site of action. Herbicide-resistant weed seed populations begin as a small percentage of the original population and consist of one or more rare variants within a species that resist a herbicide that usually kills the weed species. Susceptible biotypes are reduced in the seed bank through repeated use of the herbicide or herbicides with the same site of action, while resistant biotypes increase until the weed population is no longer controlled effectively with that group of herbicides. Herbicide resistance may be based on differential absorption, translocation, metabolism, an altered site of action, sequestration of the herbicides or overexpression of the target protein. Herbicide resistance can result from a single gene mutation or a combination of multiple gene changes. Single-gene mutation resistance often confers a relatively high level of resistance, and population shifts occur rapidly. Multiple-gene resistance often is a lower level of resistance that gradually increases through time and is more difficult to confirm. An understanding of the way herbicides act to kill weeds (herbicide mode of action) is useful in selecting and applying the proper herbicide for a given weed control problem. Herbicide mode of action information also is useful in diagnosing injury from herbicides. Although many herbicides are available, they can be categorized into groups with similar chemical and phytotoxic properties. The Weed Science Society of America (WSSA) has developed a numbered classification system based on the herbicide site of action or the specific plant process disrupted by the herbicide. Knowledge of herbicide sites of action allows proper selection and rotation of herbicides to reduce the risk of developing herbicide-resistant weeds. The following sections describe the characteristics of widely used herbicide families grouped by mode of action and the WSSA classification number (in parentheses). These eight major modes of action are growth regulators, amino acid synthesis inhibition, lipid synthesis inhibition, seedling growth inhibition, photosynthesis inhibition, nitrogen metabolism, pigment inhibition and cell membrane disruption. The growth-regulator herbicides consist of synthetic auxin and auxin transport inhibitor compounds, including phenoxy acetic acid, benzoic acid, pyridine, arylpicolinate, pyrimidine and quinoline. Growth-regulator herbicides can act at multiple sites in a plant to disrupt hormone balance and protein synthesis and thereby cause a variety of plant growth abnormalities. 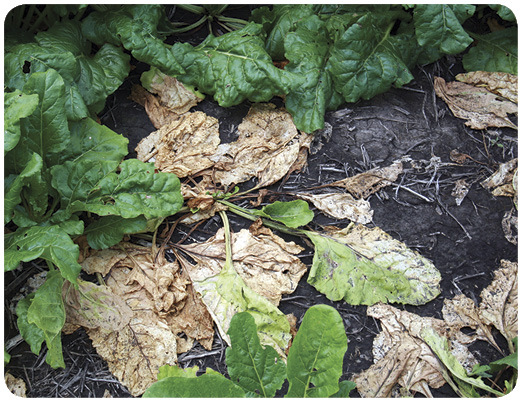 Growth-regulator herbicides control broadleaf weeds, and most will injure sugar beet. Herbicides in this group can move in the xylem and phloem to areas of new plant growth. As a result, many herbicides in this group are effective on perennial and annual broadleaf weeds. Herbicide uptake primarily is through the foliage, but root uptake also may occur. Auxin transport inhibitors such as diflufenzopyr inhibit the movement of auxinic compounds from meristematic cells. Thus, when combined with an auxin herbicide such as dicamba, the herbicide moves into these cells but cannot move out, resulting in greater concentrations of the auxininic herbicide within meristematic regions. 2,4-D-amine, -choline or -ester salt for barley, corn, oat, pastures, rangeland, Enlist soybean and wheat. MCPA for alfalfa, barley, oat, pastures, rangeland and wheat. 2,4-DB for alfalfa and soybean. b. 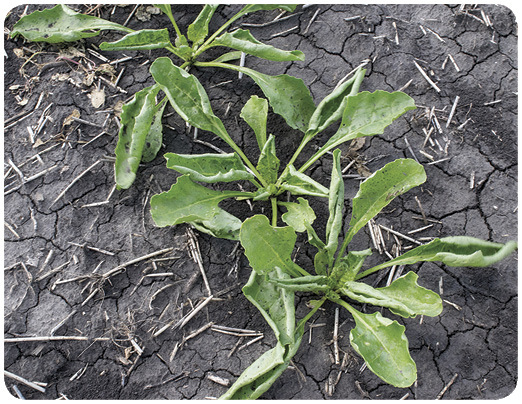 Injury symptoms: All phenoxy acetic acids produce identical symptoms in sugar beet. 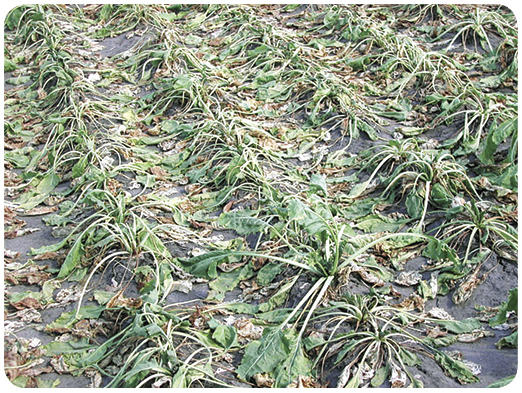 Sugar beet leaves will lay flat on the ground within a few hours after exposure, and leaves may remain more prostrate than normal for the rest of the growing season if injury is sever (Photo 1). Leaf petioles exhibit twisting, also call epinasy. 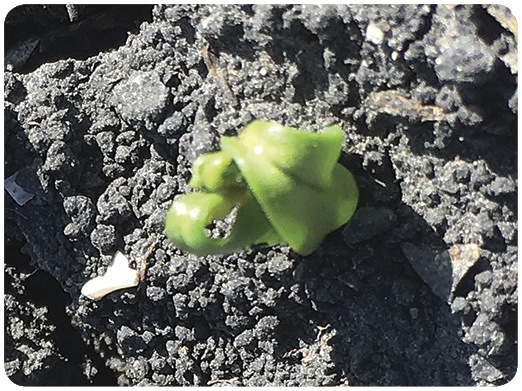 Sugar beet exposed to phenoxy acetic acids in the cotyledon to early four-leaf stage may develop fused petioles and a symptom called "celery stalking" or trumpeting" (Photo 2). Phenoxy acetic acid herbicides on larger sugar beet will not produce celery stalking. New leaf growth generally will resume at about six to 10 days after exposure to phenoxy acetic acids. New leaves often will be malformed, with wrinkled leaf margins, parallel veins or leaf strapping (Photo 3). 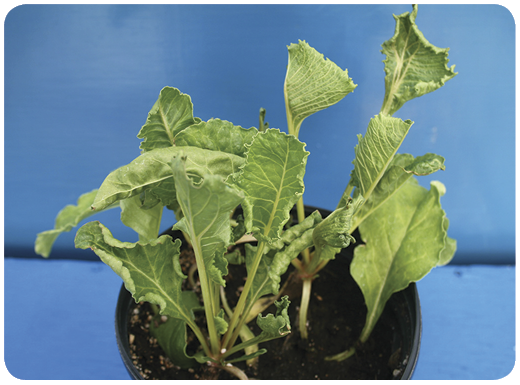 Rapid initiation of new leaf growth suggests less sugar beet injury and less sugar beet yield loss than delayed initiation of new leaf growth. 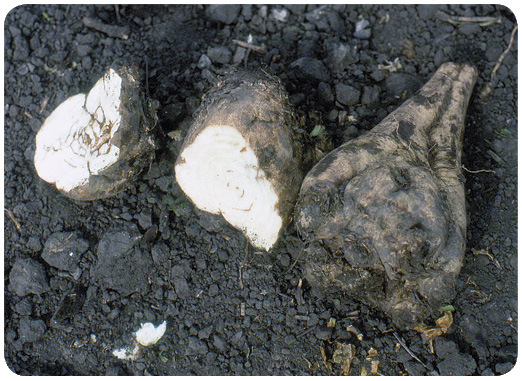 Sugar beet injured with phenoxy acetic acids should be processed immediately after harvest because injured sugar beet roots do not store as well as noninjured roots. c. Site of action: Specific site or sites unknown; one or more auxin receptors are likely candidates. b. Injury symptoms: Dicamba (Banvel, etc.) 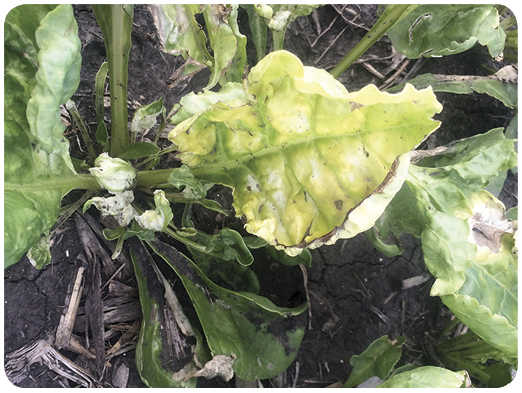 causes sugar beet injury that is visually indistinguishable from phenoxy acetic acid injury (Photo 4, Photo 5). 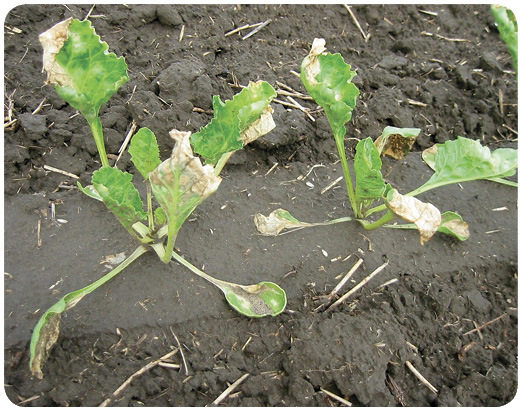 Dicamba may have sufficient residual in the soil to reduce emergence and to injure emerging sugar beet (Photo 6). Emerging seedlings may be twisted, and development of the first true leaves may be inhibited. Dicamba residual in soil can cause “trumpeting” symptoms, which also can be caused by early postemergence exposure from phenoxy acetic acid herbicides. Like with 2,4-D, new leaves often will be malformed, with wrinkled leaf margins, parallel veins or leaf strapping (Photo 7). Aminopyralid (Milestone) for pastures and rangeland. Clopyralid (Stinger) for corn, oat, pastures, rangeland, sugar beet and wheat. Fluroxypyr (Starane) for barley, corn, oat and wheat. Picloram (Tordon) for pastures and rangeland. Halauxifen (Elevore) for fallow ground ahead of multiple crops. Aminocyclopyrachlor (Method) for non-crop areas. Quinclorac (Facet) for pastures, rangeland and wheat. b. Injury symptoms: Injury symptoms are very similar to the phenoxy acetic acids or benzoic acids (Photo 8). Stinger is registered on sugar beet but can cause leaves to roll upward from the edges in some environments or at high rates (Photo 9). 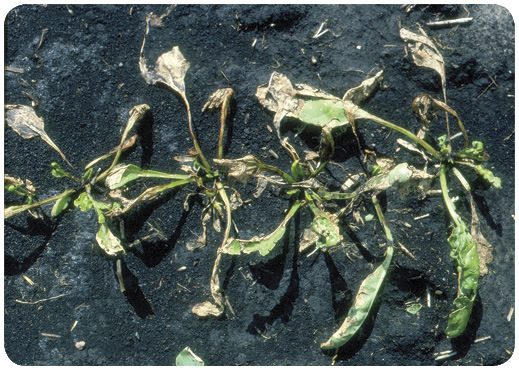 Sugar beet damage, although not common, occurs more frequently on older plants (six to 10 leaves) than younger plants (two to four leaves). Injury is transient and does not cause yield loss. c. Site of action: Specific site or sites are unknown; one or more auxin receptors are likely candidates. a. Use: Diflufenzopyr + dicamba (Status) for corn. b. 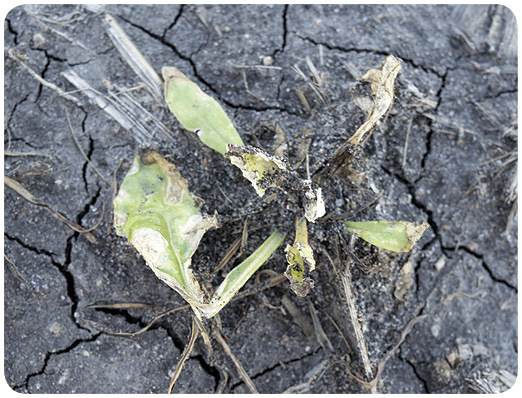 Injury symptoms: Diflufenzopyr has minor herbicide activity when applied alone. c. Site of action: Specific site or sites unknown, but it likely is one or more auxin transport proteins. The amino acid synthesis inhibitors include the imidazolinone, sulfonylurea, sulfonylamino carbonyltriazolinone, triazolopyrimidine and amino acid-derivative herbicide families. Amino acid synthesis inhibitors act on a specific enzyme to prevent the production of specific amino acids, key building blocks for normal plant growth and development (Figure 1). Figure 1. Enzymes function as steps in biological processes. Enzymes are also extremely specialized in their function. As a result, many different enzymes are involved with the many different biological processes that occur within a plant. Some herbicides can stop specific enzymes from functioning, resulting in a disruption of specific plant processes; this often leads to the death of the plant. This herbicide-enzyme relationship is very specific and any chemical modification of the herbicide or enzyme can eliminate herbicidal activity. Imidazolinone, sulfonylurea, sulfonylamino carbonyltriazolinone and triazolopyrimidine herbicides prevent the production of three essential branched-chain amino acids by inhibiting one key plant enzyme, acetolactate synthase (ALS enzyme). The amino acid derivative herbicide inhibits the production of three essential aromatic amino acids by inhibiting another key plant enzyme, 5-enolpyruvylshikimate-3-phosphate (EPSP) synthase. In general, injury symptoms are slow to develop, especially in cold weather (seven to 14 days) and include stunting or slowing of plant growth and slow plant death. Herbicides in the imidazolinone, sulfonylurea, sulfonylamino carbonyltriazolinone and triazolopyrimidine families can move in the xylem and phloem to areas of new growth and can be taken up through plant foliage and roots. Herbicides in these families vary greatly in selectivity and may control annual and perennial broadleaf or grass weeds and may be soil or foliar applied. Glyphosate, an amino acid-derivate herbicide, is nonselective and the site of uptake is the plant foliage. Glyphosate moves via the phloem to all parts of the plant and is an excellent perennial weed control herbicide that is active on annual weeds as well. Glyphosate is inactive in soil because of strong adsorption. Glyphosate-resistant crops with an alternative EPSP synthase enzyme have been developed through genetic engineering. Imazamox (Raptor) for alfalfa, Clearfield canola, dry bean, field pea, soybean and Clearfield lentil and sunflower. Imazethapyr (Pursuit) for alfalfa, chickpea, dry bean, lentil, field pea and soybean. b. Injury symptoms: Same as sulfonylurea; see next section. c. Site of action: Acetolactate synthase (ALS) enzyme; also referred to as acetohydroxy acid synthase (AHAS). Halosulfuron (Permit) for corn, dry bean, pastures and rangeland. Metsulfuron (Ally) for barley and wheat. Rimsulfuron (Matrix) for corn and potato. Sulfosulfuron (Maverick) for pastures and wheat. Thifensulfuron (Harmony) for barley, SU canola, corn, oat, STS soybean, and wheat. Tribenuron (Express) for sbarely, SU" canola, corn, oat, Express Sun sunflower and wheat. Triflusulfuron (UpBeet) for sugar beet. b-1. Injury symptoms from soil residual: Symptoms from sulfonylurea herbicides are identical to imidazolinone, triazolopyrimidine and sulfonylamino carbonyltriazolinone herbicides. 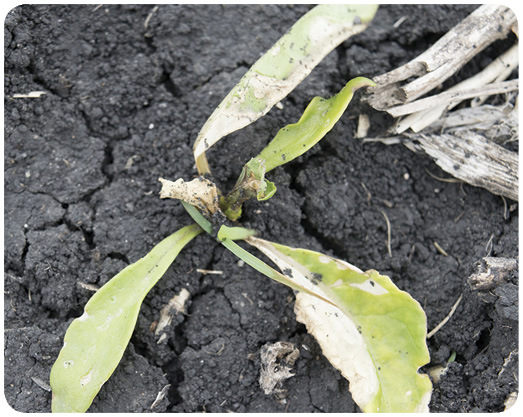 Not all injured plants will exhibit all symptoms, and symptoms may vary from field to field. Sugar beet plants may be stunted (Photo 10) and the leaves usually become a bright yellow with first yellowing on young leaves (Photos 11, 12). 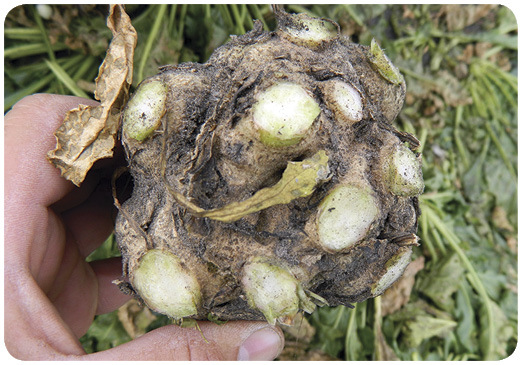 Phenotype mimics rhizomania-susceptible sugar beet (Photo 13). 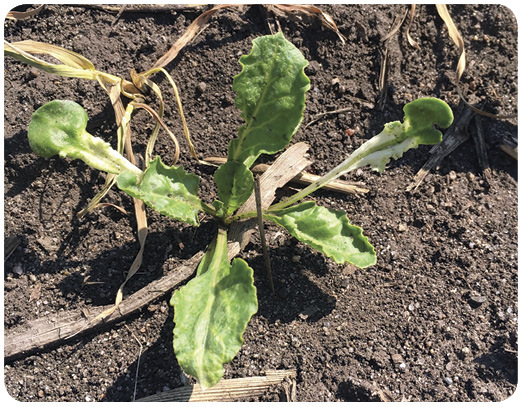 Relatively high levels of herbicide residual in soil may cause the plants to form a rosette rather than a normal sugar beet plant (Photos 14, 15, 16). The total root and hypocotyl of sugar beet seedlings may turn brown and shrivel (Photo 17, upper plant) or the root may turn brown and die, starting at the point where the root joins the hypocotyl, about 1 to 1.5 inches below the soil surface (Photo 17, lower plant). 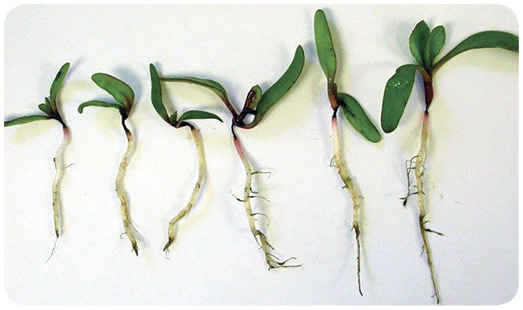 Plants with injury similar to the upper plant in Photo 17 will often die due to a nonfunctional root system, but plants with injury similar to the lower plant often will survive by producing secondary roots from the hypocotyl. However, low moisture in the surface 2 inches of soil can prevent the successful production of secondary roots and the damaged plant would then die. Nearly identical symptoms on roots of seedling sugar beet also can be caused by dinitroaniline herbicides and Aphanomyces cochlioides, a fungal disease (Photo 18). Plants that survive and grow may produce new leaves that are more strap-shaped than normal (Photo 19). b-2. Injury symptoms from postemergence exposure: Symptoms from imidazolinone and sulfonylurea herbicides are identical. 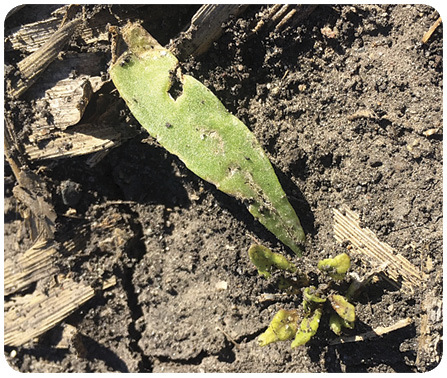 Not all injured plants will exhibit all symptoms, and symptoms may vary from field to field (Photos 20, 21, 22). Plant leaves will become prostrate a few hours after exposure, similar to the effect from phenoxy acetic acids, dicamba or pyridines. Older leaves may remain prostrate for several weeks. However, the petiole epinasty from imidazolinone or sulfonylurea herbicides is less than from phenoxy acetic acid, dicamba or pyridine herbicides. Yellowing of the youngest leaves begins about four to five days after exposure, and the yellowing intensifies and spreads to the older leaves with time. Severely affected leaves or whole plants may die and turn brown. Petioles may turn black or have black streaks as symptoms worsen (Photo 23). The color contrast between affected and normal plants can become quite evident (Photo 24). The yellow may disappear later in the season as affected plants recover and begin to produce new leaves. Some affected plants may develop brown rings in the roots within five to seven days after exposure (Photo 25). These rings still may be present at harvest (Photo 26). Plants injured by imidazolinone or sulfonylurea herbicides often produce new leaves in clusters rather than in pairs. This can result in more than one crown per root (Photo 27). These plants may be more difficult to defoliate than normal plants (Photo 28). Young seedling exposure to imidazolinone or sulfonylurea herbicides can cause root symptoms similar to those from soil residual (Photo 17). b. Injury symptoms: Same and sulfonylurea; see previous section. Cloransulam (FirstRate and Surveil) for soybean. Flumetsulam (Python, Surestart II and Tripleflex II) for corn and soybean. Pyroxsulam (Goldsky and PerfectMatch) for wheat. b. Injury symptoms: Same as sulfonylurea; see previous section. a. Use: Glyphosate (several trade names) nonselective weed control before crop emergence, for spot treatments in some crops, pasture and noncropland or postemergence grass, broadleaf and perennial control in glyphosate-resistant (Roundup Ready) crops. b. 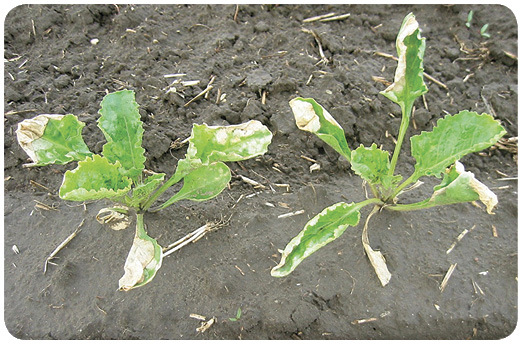 Injury symptoms: Sugar beet injury in susceptible varieties from glyphosate is quite similar to injury from imidazolinones or sulfonylureas. However, the yellowing from exposure to glyphosate starts with the older leaves and moves toward the younger leaves, while injury from imadazolinone or sulfonylurea herbicides starts with the younger leaves and moves toward the older leaves. Glyphosate can cause browning in the roots similar to the imidazolinone or sulfonylurea herbicides. c. Site of action: 5-enolpyruvylshikimate-3-phosphate synthase (EPSP synthase) enzyme. The lipid inhibitors include the cyclohexanedione, aryloxyphenoxypropionate and phenylpyrazolin herbicide families. These herbicides prevent the formation of fatty acids, components essential to produce plant lipids. Lipids are vital to the integrity of cell membranes and new plant growth. The lipid inhibitor herbicides inhibit a single key enzyme, acetyl-CoA carboxylase, involved in fatty acid biosynthesis. Broadleaf plants are tolerant to these herbicide families, but almost all perennial and annual grasses are susceptible. These herbicides are foliar-applied and move in the phloem to areas of new growth. Injury symptoms are slow to develop (seven to 10 days) and appear first on new leaves emerging from the whorl of the grass plant. Plants gradually will turn purple and brown, and die, but older leaves may stay green for a long time. These herbicides are short-lived in the soil, have a low water solubility and are used at relatively low rates. They have a low leaching potential. Application of the postemergence grass herbicides tank-mixed with a broadleaf herbicide often results in reduced grass control, a response called antagonism. The antagonism can be overcome by applying the separate herbicides several days apart or by increasing the rate of the grass-control herbicide in the tank mix. Clethodim (Select, Select Max) for alfalfa, canola, chickpea, dry bean, field pea, flax, lentil, tame mustard, potoato, soybean, sugar beet and sunflower. Sethoxydim (Poast) for alfalfa, canola, chickpea, dry bean, field pea, flax, lentil, tame mustard, potato, soybean, sugar beet and sunflower..
b. 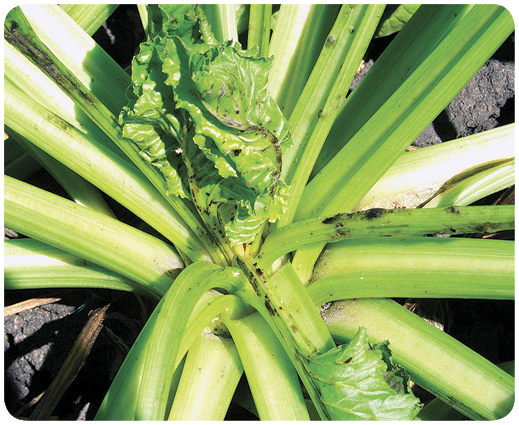 Injury symptoms: Sugar beet is not injured by cyclohexanediones, even at high rates. c. Site of action: Acetyl-CoA carboxylase enzyme. Clodinafop-P (Discover NG) for wheat. Fenoxaprop-P (Puma) for barley and wheat. Fluazifop-P (Fusilade DX) for soybean and sugar beet. Quizalofop (Assure II) for canola, chickpea, dry bean, field pea, flax, lentil, soybean, sugar beet and sunflower. b. 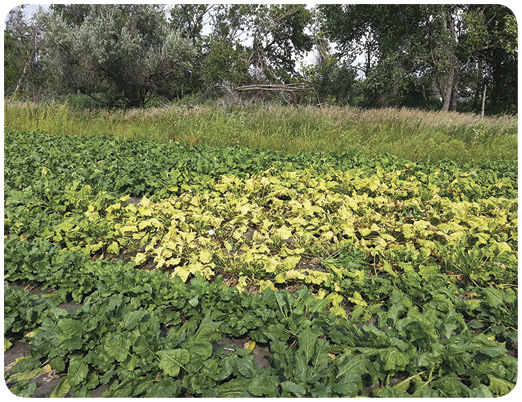 Injury symptoms: Sugar beet is not injured by aryloxyphenoxypropionates used alone but would be injured by mixtures with other herbicides such as in Wolverine Advanced. a. Use: Pinoxaden (Axial XL) for barley and wheat. b. 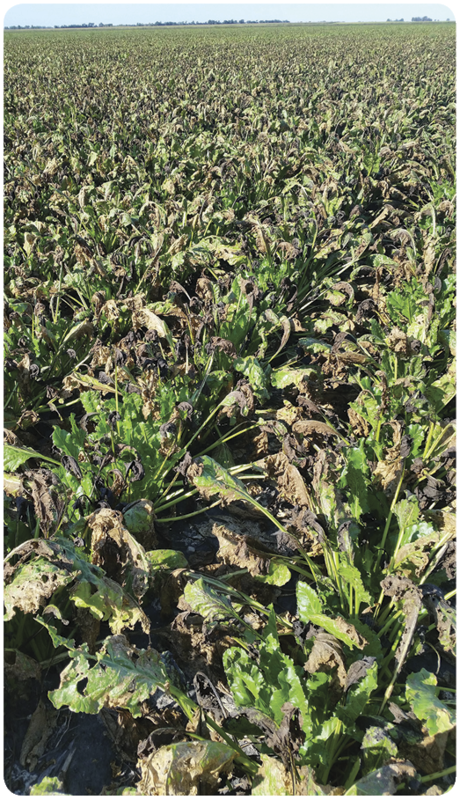 Injury symptoms: Sugar beet is not injured by phenylpyrazolin used alone but would be injured by mixture with other herbicides such as Axial Star. The seedling growth inhibitors include the dinitroaniline, chloroacetamide, isoxazoline, thiocarbamate and benzofuran herbicide families. These herbicides have little or no foliar activity and are applied preplant incorporated or pre-emergence to control weeds effectively. In some uses, these herbicides are applied after crop emergence but before weed emergence (lay-by). In general, seedling growth inhibitors are most effective on small-seeded broadleaf and grass weeds. Large-seeded weed generally survive normal dosages because their root and shoot rapidly grow through the herbicide treated zone in soil. Seedling growth inhibitors interfere with new plant growth, thereby reducing the ability of seedlings to develop normally in the soil. Plants can take up these herbicides after germinating until the seedling emerges from the soil. Therefore, these herbicides are effective only on seedling annual or perennial weeds. Plants that have emerged from the soil uninjured are likely to remain unaffected. 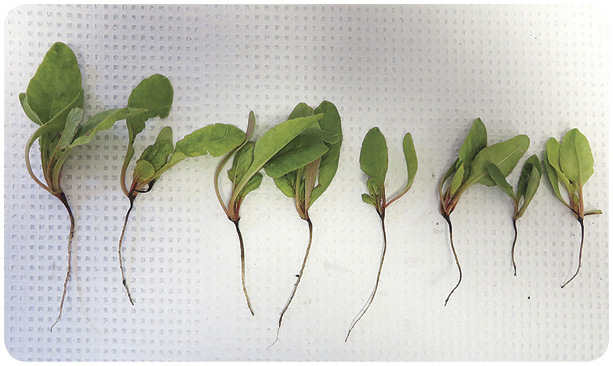 Seedling growth inhibitors are active at two main sites: the developing shoot and the root. Much more is known about the action of seedling root-inhibitor herbicides than seedling shoot-inhibitor herbicides. The root inhibitors are mitotic poisons that interrupt cell division, which inhibits shoot elongation and lateral root formation. Uptake is through developing roots and shoots of emerging seedlings but are not readily translocated. Thus, herbicide injury is confined primarily to plant roots and shoots. Selectivity may be based on metabolism, herbicide placement and type of emergence of grass species. The emerging shoot is the primary site of absorption on grass species. Injury symptoms on grass species include short, swollen coleoptiles. Injured broadleaf plants often have swollen hypocotyls. Both grasses and broadleaves may have short, stubby secondary roots. Thus, affected plants may be stunted and exhibit nutrient deficiency or drought symptoms because of poorly developed root systems. Shoot-inhibiting herbicides are absorbed from the soil solution or vapor phase through roots and emerging shoots but are translocated only in the xylem. The primary site of absorption and action is the emerging shoot and growing point with thiocarbamates and roots (broadleaf species) and emerging shoots (grass species) with chloroacetamides. Present evidence suggests that these herbicides can affect multiple sites within a plant, primarily interfering with fatty acid and lipid biosynthesis. Ethalfluralin (Sonalan) for anola, chickpea, dry bean, field pea, lentil, potato, soybean and sunflower. Pendimethalin (Prowl/Prowl H2O) for chickpea,corn (pre-emergence only), dry bean, field pea, lentil, pastures, potato, rangeland, soybean, sunflower and wheat. Trifluralin (Treflan) for alfalfa, canola, chickpea, dry bean, field pea, flax, lentil, tame mustard, potato, soybean, sunflower and wheat. b. 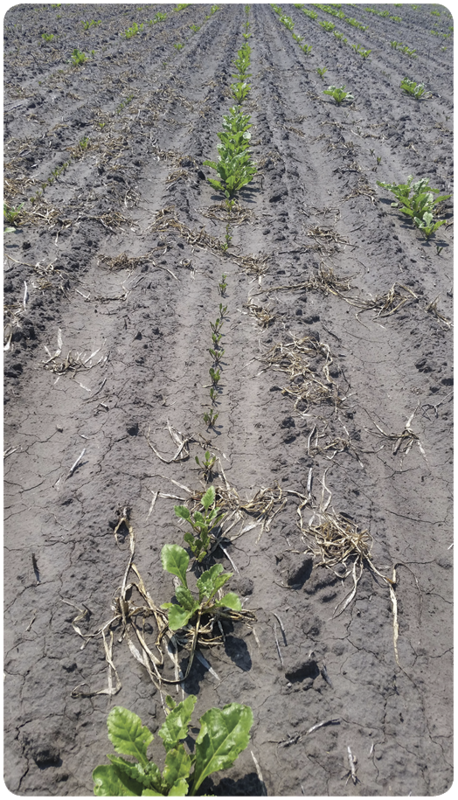 Injury symptoms: Dinitroaniline residual in soil may cause sugar beet to be severely stunted (Photo 29), with small leaves that are more erect than normal (Photo 30). 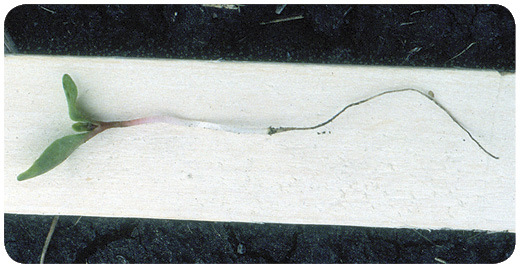 The roots of damaged sugar beet seedlings may turn brown and die, starting at the point where the root joins the hypocotyl, about 1 to 1.5 inches below the soil surface (Photo 31). Plants with dead roots may die or they may survive by producing secondary roots from the hypocotyl. 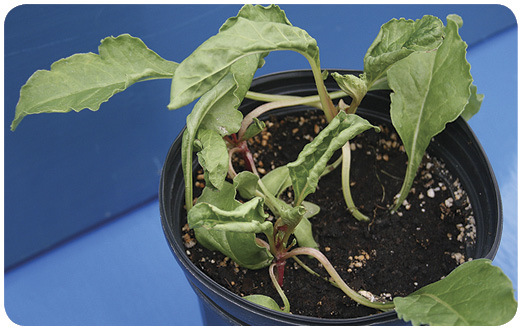 Identical symptoms on roots of seedling sugar beet also can be caused by imidazolinone, sulfonylurea, triazolopyrimidine or N-Phenylphtalimide herbicides and by Aphanomyces, a fungal disease. Affected plants will be smaller than unaffected plants. Plant regrowth by secondary root production would be prevented by drought in the surface 2 inches of soil and injured plants would die. Imidazolinone, sulfonylurea, sulfonylamino carbonyltriazolinone, triazolopyrimidine and N-phenylphthalimide herbicides also can cause similar seedling root death. c. Site of action: Tubulin protein involved in cell division. Acetochlor (Harness, Warrant, Surpass) for corn, soybean and sugar beet. S-metolachlor (Dual Magnum) for chickpea, corn, dry bean, field pea, lentil, potato, soybean and sugar beet and sunflower. Dimethenamid-P (Outlook) for corn dry bean, lentil, potato, soybean and sugar beet. b. 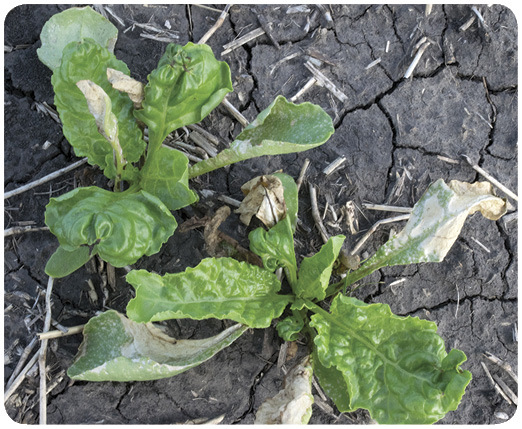 Injury symptoms: Chloroacetamide herbicides cause no distinctive symptoms on sugarbeet. But over-application or extended periods of cool, wet weather shortly after planting may sometime cause damage on sugar beet. 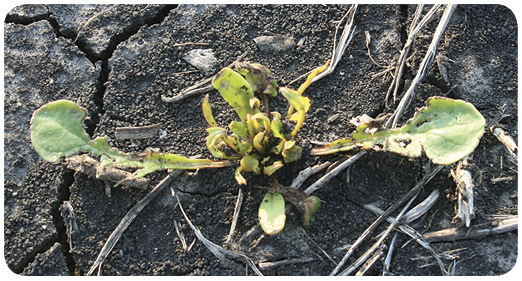 Sugar beet stand loss may occur because some plants may die before emergence. Emerged but injured sugar beet may also be chlorotic in appearance and /or are stunted (Photo 32). Sugar beet along the row are not uniform; some are stunted and chlorotic, and other plants are normal in appearance (Photo 33). c. Site of action: Specific sites or sites believed to inhibit very long chain fatty acid synthesis. a. Use: Pyroxasulfone (Zidua) for corn, soybean, sunflower and wheat. b. Injury symptoms: Same as chloroacetamides; see previous section (Photo 34). EPTC (Eptam) for alfalfa, dry bean, potato, sugar beet and sunflower. Triallate (Far-Go) for barley, chick pea, field pea, lentil, sugar beet and wheat. Cycloate (Ro-Neet SB) for sugar beet. b. Injury symptoms: Thiocarbamates reduce the formation of epicuticular wax on leaves, which can cause leaves to fuse together rather than unfold normally (Photo 35). Affected plants may be stunted, leaves may be shortened and thickened, or true leaf development may be inhibited (Photo 36). Some severely stunted plants may die, while others will start producing new leaves and will produce a nearly normal-sized root at harvest. Severely stunted plants may grow very little for two or more weeks after emergence and then make a complete or nearly complete recovery. c. Site of action: Specific site or sites unknown; believed to have multiple sites of action. a. Use: Ethofumesate (Nortron, Ethotron, Ethofumesate SC) for sugar beet. b. 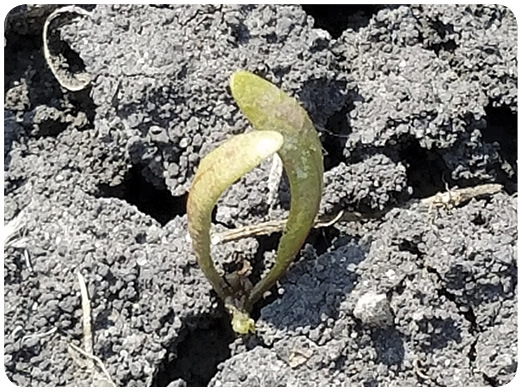 Injury symptoms from soil residual: Benzofurans, like thiocarbamates, reduce the formation of epicuticular wax on leaves, which can cause leaves, especially leaves of cotyledon to two-leaf sugar beet, to fuse together rather than unfold normally (Photo 37). This phenotype is most common in low-organic matter or course-textured soils (Photo 38). Affected plants may be stunted. c. Injury symptoms from postemergence exposure: Ethofumesate soil applied decreases epicuticular wax and may increase injury from postemergence herbicide such as Betamix or from chloroacetamide herbicides by increasing foliar penetration. d. Site of action: Specific site or sites not well understood; believed to inhibit biosynthesis of very long chain fatty acids. The photosynthesis inhibitors include triazine, triazinone, phenylurea, benzothiadiazole, nitrile and phenyl-carbamate family herbicides. Photosynthesis inhibitors disrupt the photosynthetic (food producing) process in susceptible plants by binding to specific sites within the photosystem II complex in plant chloroplasts. Inhibition of photosynthesis could result in slow starvation of the plant; however, in many situations, rapid death occurs perhaps from the production of secondary toxic substances. Injury symptoms include interveinal yellowing (chlorosis) and death (necrosis) of leaf tissue beginning at the leaf margins and progressing toward the center of leaves. The triazines, triazinones, phenylureas and uracils are taken up into the plant via the roots or foliage and move in the xylem to plant leaves. As a result, injury symptoms first will appear on the older leaves, along the leaf margin. They also have relatively long persistence in soil. The benzothiadiazoles and phenyl-carbamates are foliar-applied photosynthetic inhibitors and generally remain in the foliar portions of the treated plant. They are contact herbicides requiring thorough spray coverage of the foliage for good weed control. Movement from the foliage to roots is negligible. a. Use: Atrazine for corn. b. 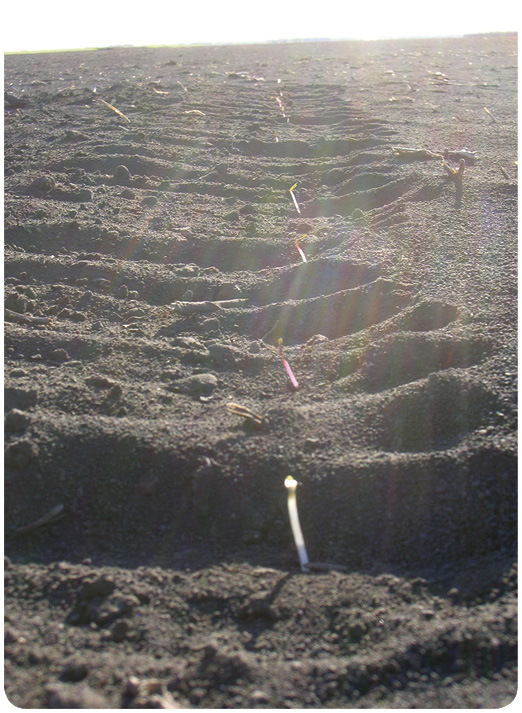 Injury symptoms: Residual of photosynthesis inhibitors in soil does not prevent seedlings from germinating or emerging. Injury symptoms occur after emergence, and the speed of appearance of symptoms will be more rapid with sunny days than with cloudy weather. Also, symptoms will be more severe and more rapid as the level of herbicide in the soil increases. 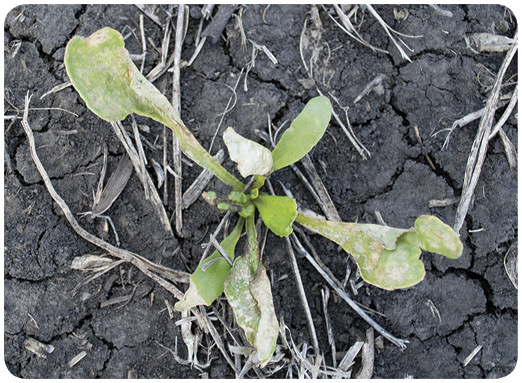 Sugar beet plants may be in the two- to four-leaf stage before symptoms become noticeable, but plants can die in the early two-leaf stage. 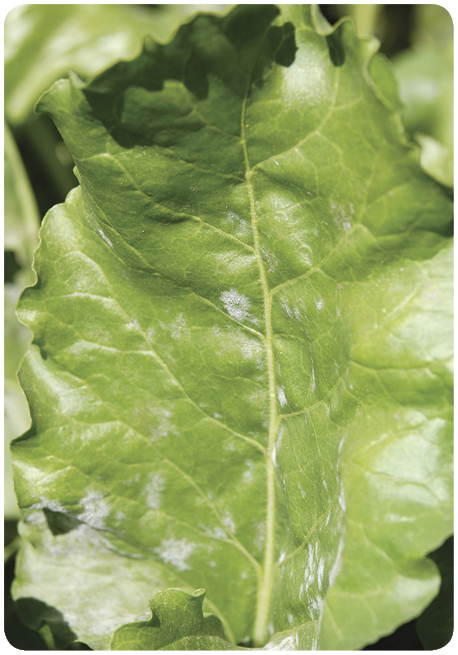 Initial symptoms include browning of the cotyledonary leaves and yellowing of the true leaf margins. Browning of leaves will increase with time and total desiccation may result. Older and larger leaves are affected before younger leaves (Photo 39). Triazines residues are most likely to occur following years with low rainfall because chemical and microbial activity needed to degrade herbicides are limited in dry soil. There are other herbicide tank mixtures that can cause similar visual damage (Photo 40). Postemergence triazine herbicides cause an initial yellowing followed by desiccation and leaf browning. 39. Sugar beet damage from atrazine residual in soil. Sugar beet germinated and emerged and field had a harvestable stand. 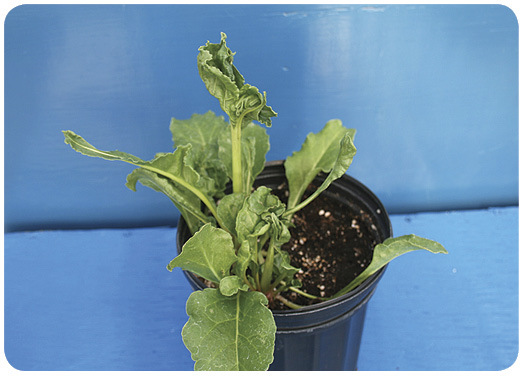 Sugar beet was at the four- to six-leaf stage before injury began to appear. Injury was chlorosis followed by necrosis beginning at the leaf margins in older leaves. c. Site of action: D1 quinone-binding protein (photosystem II) of the photosynthetic electron transport chain, binding site A.
a. Use: Metribuzin (Sencor, Dimetric) for alfalfa, corn, field pea, lentil, soybean and potato. b. Injury symptoms: Same as for the triazines; see previous section. Linuron (Lorox) for corn, potato and soybean. Tebuthiuron (Spike) for pastures and rangeland. b. Injury symptoms: Same as for the triazines. a. Use: Terbacil (Sinbar) for alfalfa. b. Injury symptoms: Same as for the triazine herbicides. a. Use: Bentazon (Basagran) for corn, dry bean, field pea and soybean. b. Injury symptoms: Leaves become chlorotic and later turn brown and die. The older leaves die first. All older leaves can turn brown while the growing point remains green (Photo 41). 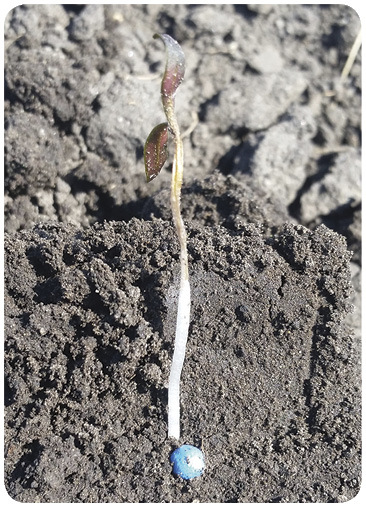 Sugar beet can recover, produce new leaves and produce a nearly normal-size root at harvest if the growing point survives (Photo 42). c. Site of action: D1 quinone-binding protein (photosystem II) of the photosynthetic electron transport chain, binding site B.
a. Use: Bromoxynil (Buctril) for alfalfa, barley, corn, flax, oat and wheat. b. Injury symptoms: Leaves become chlorotic and later turn brown and die. 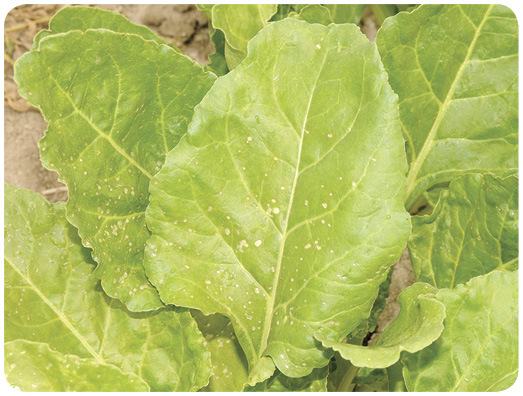 Contact with isolated spray droplets may cause a spotting or speckling of the leaves. The older sugar beet leaves will be affected more than the young leaves (Photo 43). 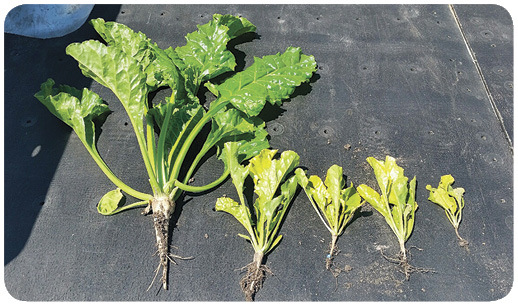 Sugar beet can produce new leaves and a harvestable root if the growing point survives. a. Use: Desmediphan+phenmedipham (Betamix) for sugar beet. b. 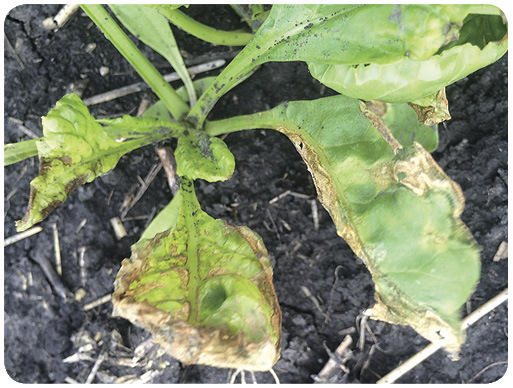 Injury symptoms: Betamix is registered for sugar beet but injury sometimes occurs, most often in a hot and moist environment. Symptoms from Betamix are very similar to symptoms from bentazon and bromoxynil. Injured leaves may turn brown and die (Photo 44). The older leaves die first, and the growing point may remain green and alive, even when most leaves are dead (Photo 45). Sugar beet plants with a surviving growing point will produce new leaves and a nearly normal-size root at harvest. The nitrogen metabolism inhibitors include the phosphorylated amino acid family herbicides. Glufosinate (Liberty) is a broad-spectrum postemergence contact herbicide that has no soil activity. Glufosinate inhibits the activity of the glutamine synthetase enzyme that is necessary for the plant to convert ammonia into other nitrogen compounds. Glufosinate has limited translocation, so uniform leaf coverage and application over small weeds generally provides the best performance. Glufosinate application during active growing conditions including bright sunny days, high relative humidity and warm temperatures (between 65 and 85 F) improves weed efficacy. a. Use: Glufosinate (Liberty) for nonselective weed control before crop emergence or applied with LibertyLink crops including canola, corn and soybean. b. 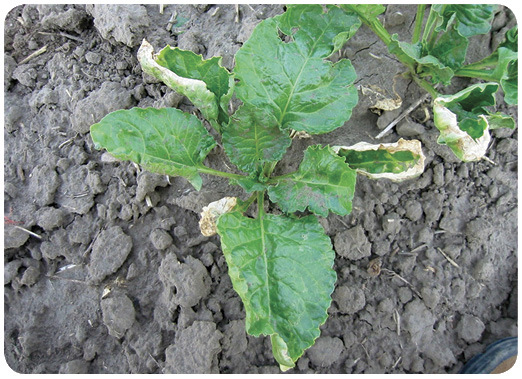 Injury symptoms: Drift on sugar beet may cause chlorotic lesions on foliage within several hours following application (Photo 46). High amounts of drift or an accidental application may cause patches of brown tissue on leaves (Photo 47). Leaf speckling (Photo 48) or necrosis from herbicides has been confused with foliar diseases such as Cercospora (Photos 49, 50) or bacterial blight. Sugar beet plants with a surviving growing point will produce new leaves and a nearly normal-size root at harvest. c. Site of action: Glutamine synthetase enzyme. The pigment inhibitors including the isoxazolidinone, isoxazole, triketone and pyrazolone herbicide families interfere with pigment production and protection of chlorophyll. Carotenoid pigments protect chlorophyll from decomposition by sunlight. As a result, the affected plant parts become white to translucent and appear bleached. Pigment inhibitors have pre-emergence and postemergence activity. Applied pre-emergence, they are taken up by plant roots and shoots and move in the xylem to the plant leaves. 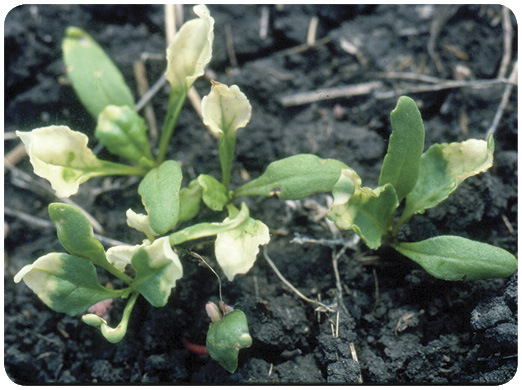 Susceptible weeds will emerge as white plants before dying. Applied postemergence, they are absorbed through the foliage and move acropetally to leaf margins. They are most effective on small weeds. 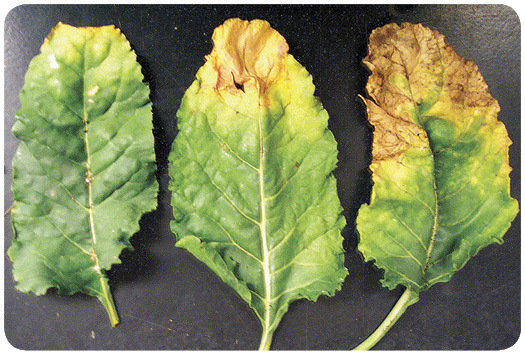 Off-target movement to nontarget plants also may cause foliage to turn white. The fate of the plant is dependent on species and size of the plant; small plants are more susceptible than large plants. Phenotype from pigment inhibitors could be confused with chimera, or a plant part that is a mixture of two or more genetically diverse types of cells. Chimeras also may arise by mutation in cells of a growing region. The new kind of tissue may be conspicuously different from old (as when it is bleached instead of great), (Photo 51). More common, the difference is evident only on special investigation, as when the number of chromosomes is altered. Although injury symptoms are similar, specific site of action is different between herbicide families. Isoxazole, triketon and pyrazolone family herbicides are soluble and are a persistent herbicidally active metabolite in soil. Thus, these families are restricted on course-textured soils or soils with a shallow water table. a. Use: Clomazone (Command) for soybean. b. Injury symptoms: All or portions of the true leaves will turn white. 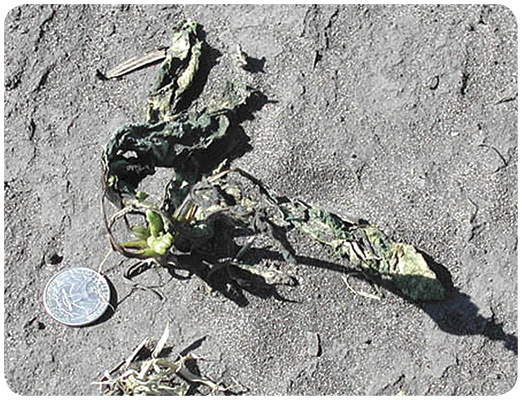 Sugar beet is relatively tolerant to clomazone residual in soil or clomazone volatility and generally plants with symptoms (Photo 52) will live, turn green and produce a nearly normal-size root at harvest. c. Site of action: 1-deoxy-D-xyulose 5-phosphate synthase (DOXP synthase). a. Use: Isoxaflutole (Balance Flexx) for corn. b. 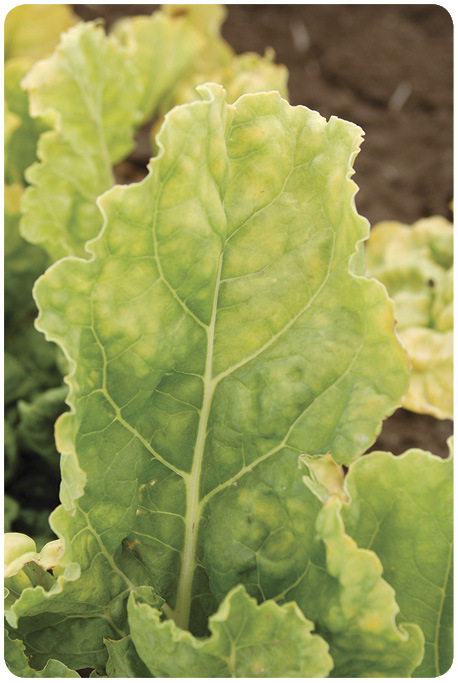 Injury symptoms: Isoxaflutole-family herbicides will turn sugar beet leaves white following spray drift. 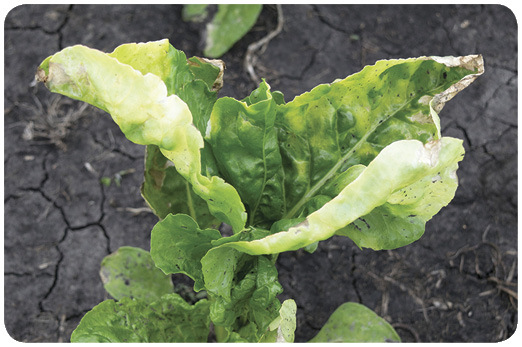 Sugar beet injury severity is dependent on dose; injury ranges from mottling injury of older tissue, bleaching of newest leaves, or bleaching and death of sugar beet. c. Site of action: 4-hydroxyphenyl-pyruvatedioxygenase (HPPD). Isoxazole and triketone family herbicides have the same mode of action; inhibition of carotenoid biosynthesis. Mesotrione (Callisto) for corn, flax and oat. A component of many premixes including with Resicore. Tembotrione (Laudis) for corn. Component of Diflexx DIO, corn and Capreno corn. Bicyclopyrone for barley, corn and wheat (component of Acuron for corn and component of Tallinor for wheat and barley). b. 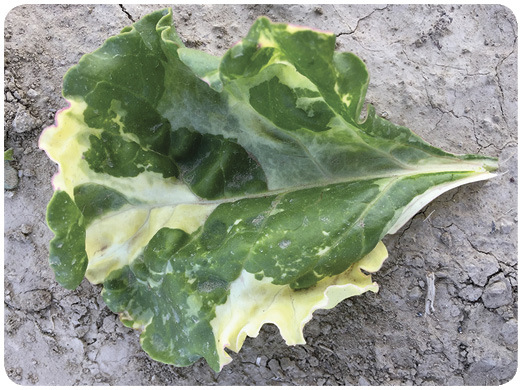 Injury symptoms: Triketone family herbicides will turn sugar beet leaves white (Photos 53, 54, 55) because of spray drift (mesotrione) or sugar beet will emerge with bleached leaves (tembotrione). 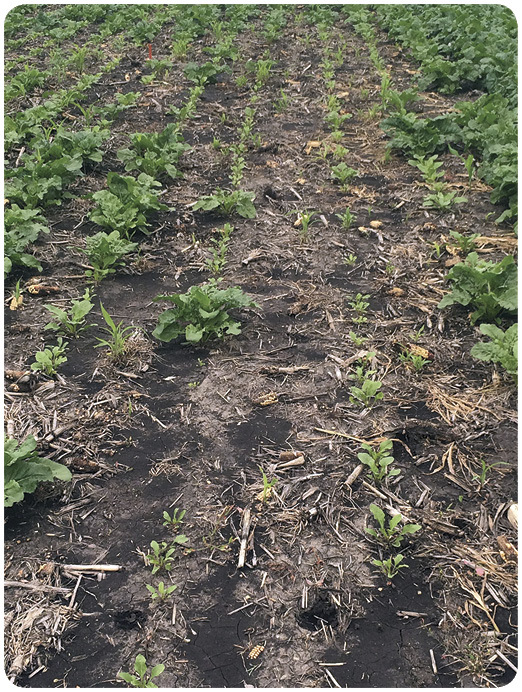 Sugar beet should not follow Laudis if cumulative precipitation between Laudis application and sugar beet planting is less than 20 inches or less than a 10-month rotational interval between Laudis application and sugar beet planting (Photo 56). c. Site of action: 4-hydroxyphenyl-pyruvatedioxygenase (HPPD). Topramezone (Impact, Armezon) for corn. Pyrasulfotole (component of Huskie, Huskie Complete and Wolverine Advanced) for barley and wheat. b. 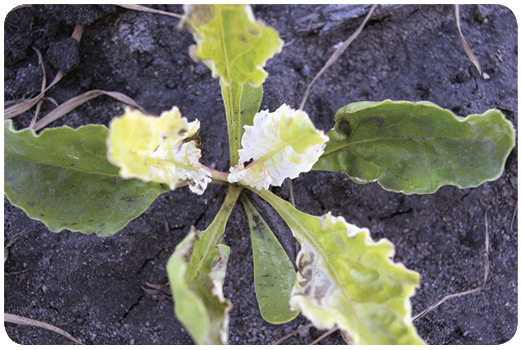 Injury symptoms: Pyrazolone family herbicides will turn sugar beet leaves white because of spray drift (Photo 57). The cell membrane disrupters include the diphenylether, imine, N-phenylphthalimide, pyrimidinedione, triazolinone and bipyridylium herbicide families. These herbicides are primarily postemergence-contact herbicides that are activated by exposure to sunlight to form oxygen compounds such as hydrogen peroxide. These oxygen compounds destroy plant tissue by rupturing plant cell membranes. Destruction of cell membranes results in a rapid browning (necrosis) of plant tissue. 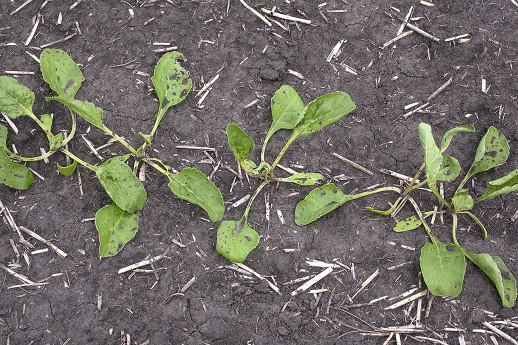 Herbicide injury symptoms can occur in one to two hours on a bright, sunny day. Because these are contact herbicides, they are excellent for burndown of existing foliage and postemergence control of annual weeds. Perennial weeds usually regrow because the herbicides do not move to underground root or shoot systems. N-phenylphthalimide, pyrimidinedione and triazolinone herbicides are soil-applied and absorbed by root and shoots. 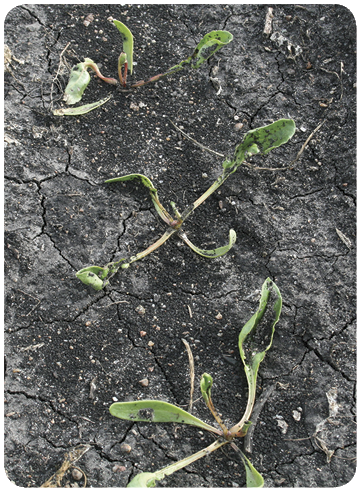 Susceptible plants become necrotic and die shortly after emergence and exposure to light following soil application. Acifluorfen (Ultra Blazer) for soybean. Fomesafen (Reflex, Flexstar) for soybean. b. 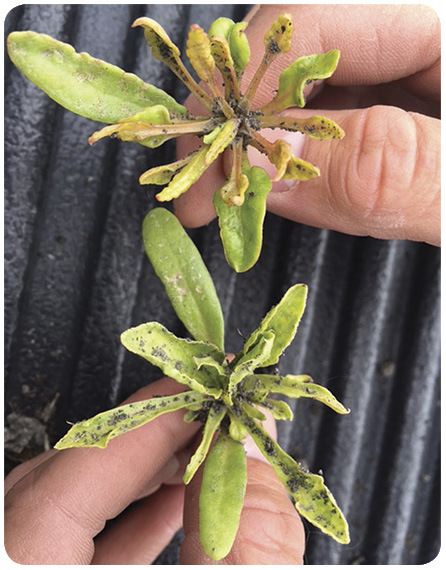 Injury symptoms: Affected leaves will exhibit desiccation where the herbicide contacts the plant (Photos 58, 59, 60). 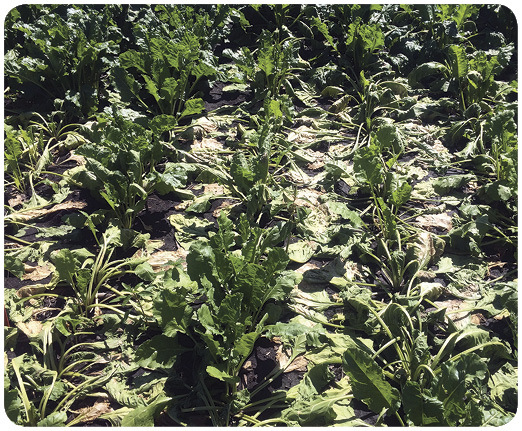 Directed or indirect application (drift) generally will not kill sugar beet, but the plants may be severely stunted, especially in high temperature and humidity environments. New growth will appear normal. 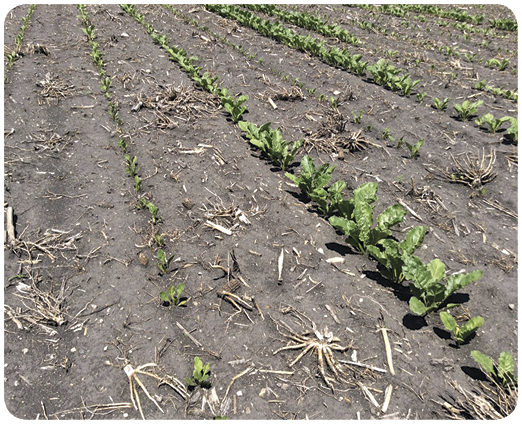 Fomesafen may carryover to sugarbeet, especially as soil pH increases above 6.5 or with cold and dry conditions that inhibit microbial activity. Injury from residues appears as stunting and mottled chlorosis and necrosis. c. Site of action: Inhibition of photoporphyringen oxidase (PPO). a. Use: Fluthiacet (Cadet) for soybean. b. Injury symptoms: Same as diphenylether herbicides; see previous section. Carryover is unlikely. a. Use: Flumioxazin (Valor/Chateau), premixes containing flumioxazin for alfalfa, corn, potato, soybean and sunflower. b. 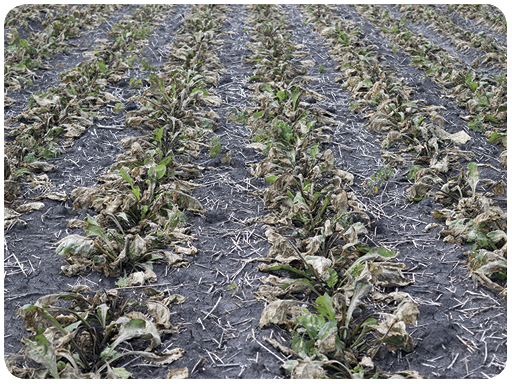 Injury symptoms: Carryover can occur when flumioxazin is applied at high rates and when tillage is limited. 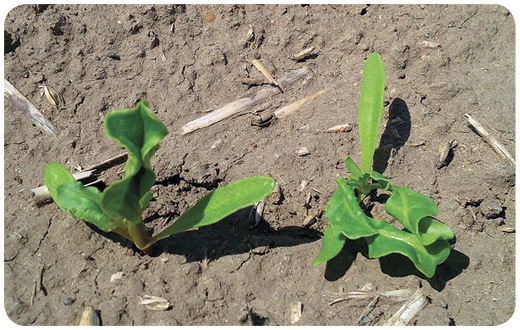 Injury is most likely when precipitation increases herbicide availability in the soil solution and as the sugar beet hypocotyl approaches or emerges through the soil surface (Photo 61). 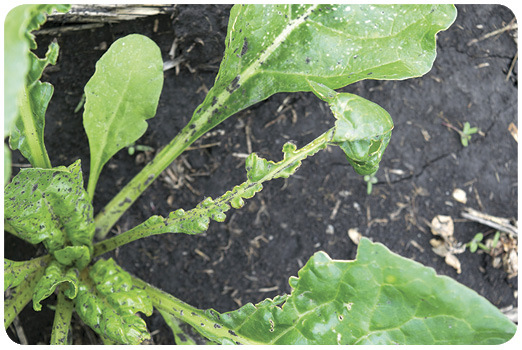 Symptoms include necrotic lesions on sugar beet cotyledons and hypocotyl, and often are more severe in poorly drained areas of the field. The hypocotyl can be girdled, resulting in sugar beet plant death (Photo 62). a. Use: Saflufenacil (Sharpen) for alfalfa, chickpea, corn, field pea, lentil and soybean; harvest aid/desiccant for small grains, dry bean, flax, field pea, soybean and sunflower. b. Injury symptoms: Same as diphenylether herbicides. 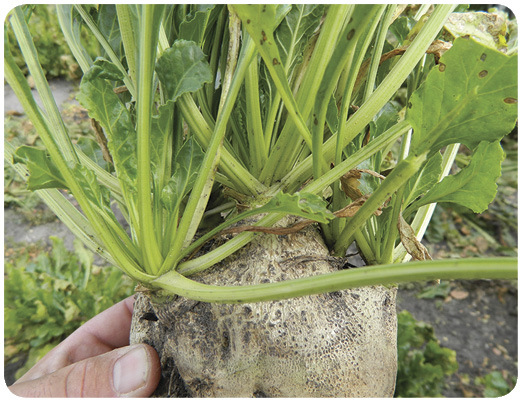 Carryover injury to sugar beet is not expected due to the short-lived residual of this active ingredient. Sulfentrazone (Spartan) for use in chickpea, dry bean, flax, field pea, lentil, potato, soybean and sunflower. In premixes, Authority Assist, Authority Elite, Authority MTS or Spartan Elite. Carfentrazone (Aim) for barley, oat and wheat. In premix Spartan Charge for chickpea, dry bean, field pea, flax, lentil, soybean and sunflower. b. Injury symptoms: Same as diphenylether herbicides (Photo 63). 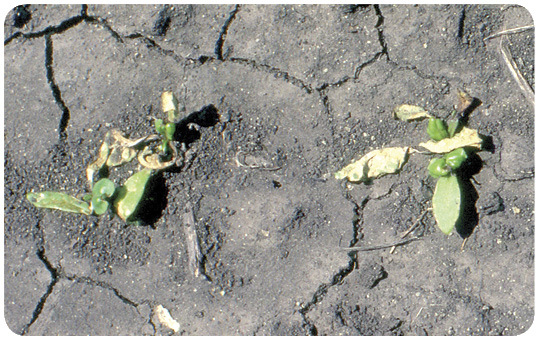 Sulfentrazone residue may remain in soil the following season(s). Sulfentrazone solubility increases as soil pH increases above 6.5, as soil texture changes from fine to coarse, and as OM decreases. As sulfentrazone solubility increases, risk of crop injury increases. Sugarbeet is ranked as a highly sensitive broadleaf crop. a. Use: Paraquat (Gramoxone SL) for nonselective weed control preplant. Desiccation of potato vine and sunflower. b. 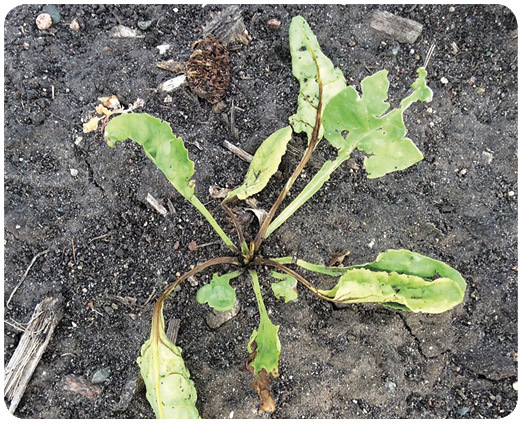 Injury symptoms: Drift on sugar beet often will appear as spotting of leaf tissue (Photo 64). High amounts of drift or an accidental application may cause patches of brown tissue on leaves (Photo 65). 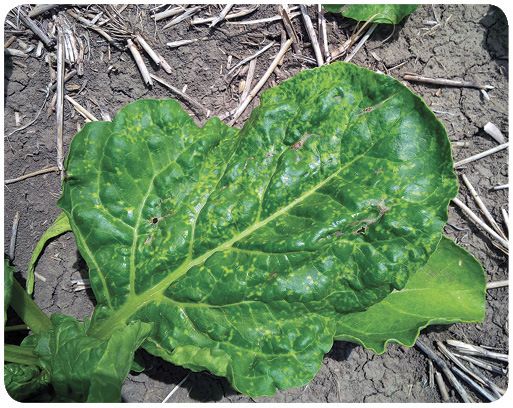 Spots from bipyridylium drift have been confused with foliar disease such as Cercospora or bacterial blight (Photo 48). Generally, the pattern of injury in a field can be used to distinguish between disease and drift. If in doubt, samples should be taken to a diagnostic laboratory for disease identification. c. Site of action: Diverts electrons from the photosystem I (PSI) complex of the photosynthetic electron transport chain. 1. 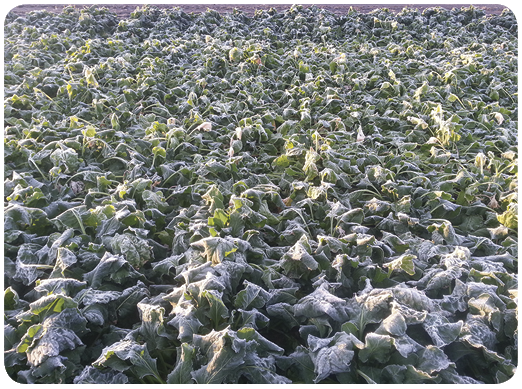 Frost: Sugar beet is sensitive to temperatures of 28 F or less until true leaves have developed. Plants develop a water-soaked appearance as they thaw (Photo 66). Frosted tissues later turn brown and desiccate (Photo 67). Frost injury is erratic and a plant may be killed next to another plant that appears uninjured. Sugar beet canopies serve as a short-term insulating barrier to help minimize freeze damage to roots in the fall (Photo 68). Evidence indicates nurse crops planted with sugar beet may provide some protection against frost. 2. 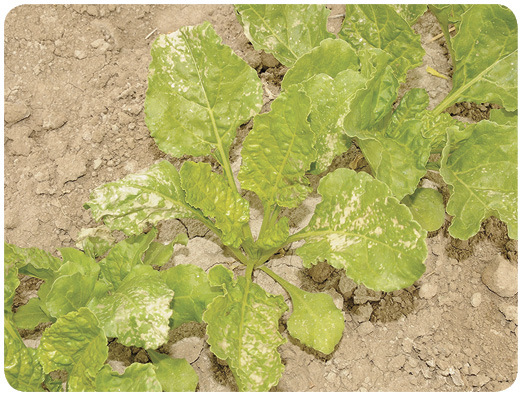 Insecticides and insect damage: Close contact between insecticide and sugar beet root can blacken or constrict root growth. 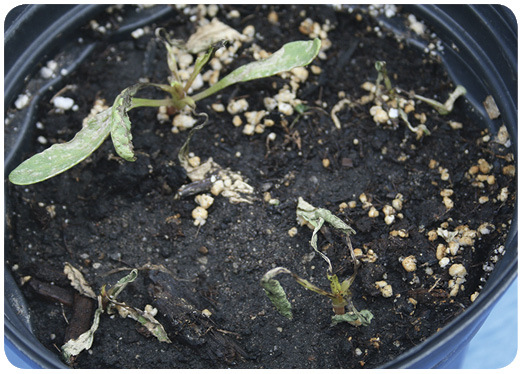 Insect damage, including stand loss, can mimic stand loss caused by herbicides such as amino acid synthesis inhibitors or seedling growth inhibitors (Photo 69). Seepage of blackened exudate from Lygus bug feeding on petiole also mimics damage caused by amino acid synthesis inhibitor (Photo 70). Yellowing and discoloration of older leaves and leaf tips mimic photosynthesis inhibitors (Photo 71). 3. Excessive water: Saturated soil can cause sugar beet to become a bright yellow with leaves that are more erect than normal. Root rots may occur due to excessive wet conditions and the lack of oxygen movement into root tips when soils are saturated for several days, especially when soil temperatures are high (Photo 72). Root rots and the odor of fermentation can be confused with effect of other root-rotting pathogens such as Rhizoctonia solani, Aphanoymces cochlioides or Pythium spp. (Photos 73, 74). 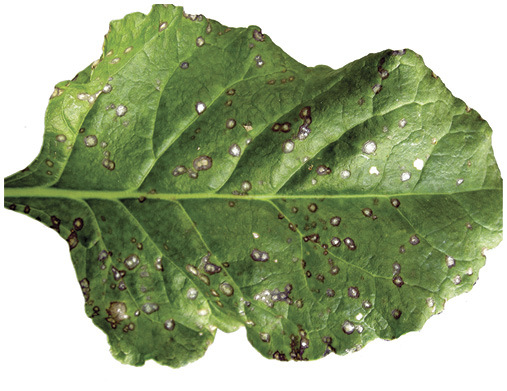 Water damage can cause sugar beet to become more susceptible to postemergence herbicides. 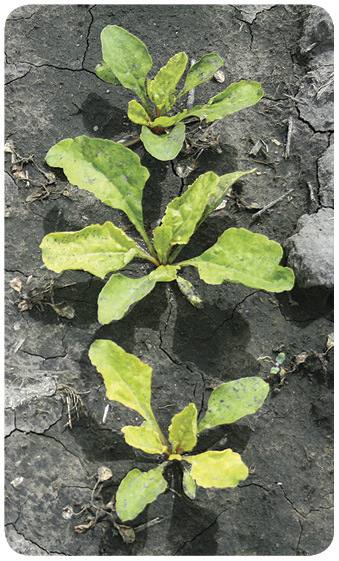 Water stress plus herbicide cause more sugar beet injury than water stress or herbicide alone. Excessive water causes fangy roots at harvest. Fangy roots indirectly increase tare due to the amount of soil lodged between roots (Figure 75). 4. Deficient water: Water stress causes plant leaves to wilt, especially during afternoon hours when temperatures are high (Photo 76). Leaves in contact with hot soil surfaces can become scorched and eventually dry. Water stress is relieved and leaves return to an upright position following precipitation or overnight cooler temperatures. 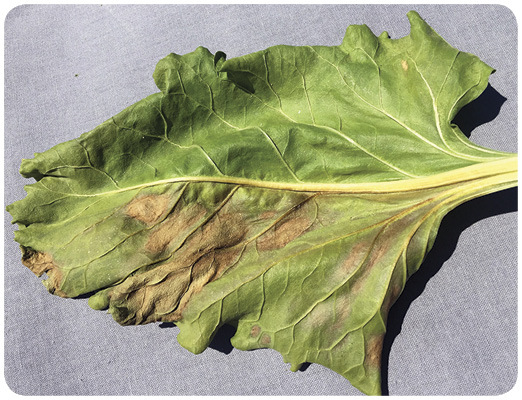 However, leaf scorch may be confused with foliar diseases, including bacterial leaf spot (Photo 77). Leaf wilting also may be a symptom associated with root pathogens such as aphanomyces or rhizomania. These problems can be distinguished by making evaluations during morning hours. 5. Hail: Hail storms may occur at any time during the growing season (Photo 78). 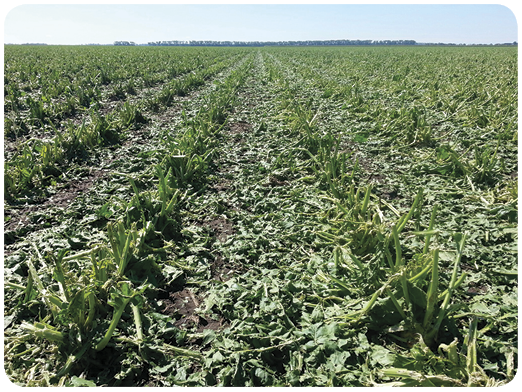 Hail reduces tonnage and sugar quality but is dependent on timing and intensity. In general, damage to foliage later in the season has greater impact on tonnage than damage earlier in the season. Intensity of defoliation also impacts sugar quality. 6. Wind: The greatest potential for damage from wind occurs in the early stages of growth. Damage often is associated with soil particles blown across the soil surface (Photo 79). Portions of the root system may be exposed as soil is removed, or small plants may be buried by soil deposits in extreme cases (Photo 80). 7. Diseases and insects: Many diseases and insects affect sugar beet. The “Compendium of Beet Disease and Insects” published by the American Phytopathological Society, 3340 Pilot Knob Road, St. Paul, MN 55121, provides an extensive description and pictures of symptoms of diseases and insect damage as well as nutritional disorders, drought, hail, lighting, crusting, salt injury and others. 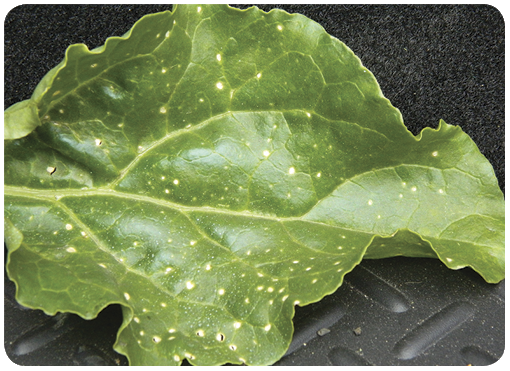 Images of important disease and insect pests in sugar beet follow (Photos 81, 82). Chimera – tissue that is a mixture of two or more genetically diverse types of cells. Chimeras also may arise by a mutation in cells of a growing region. The new kind of tissue may be conspicuously different from the old (as when it is bleached instead of green). Contact herbicides – a general classification for herbicides that are unable to move within a plant. 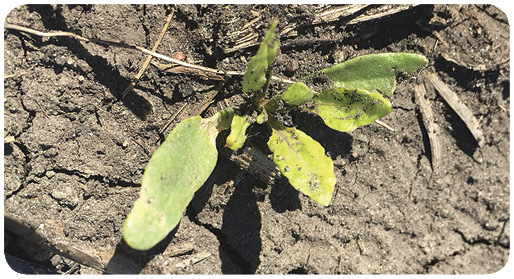 A contact herbicide’s effectiveness is highly dependent upon uniform coverage of treated soil or plant tissue. Necrosis – the death of specific plant tissue while the rest of the plant is still alive. Necrotic areas generally are dark brown. Gunsolus, J.L., and W.S. Curran. 2002. Herbicide mode of action and injury symptoms. North Central Regional Extension Publication 377. Harveson, R.M., and C.D. Yonts. 2011. 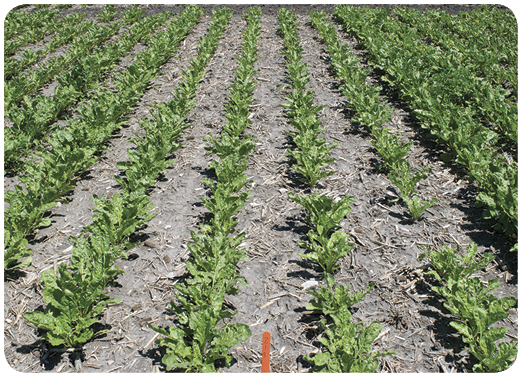 Abiotic Disease of Sugarbeets in Nebraska. Institute of Agriculture and Natural Resources, University of Nebraska-G2045. Harveson, R.M., L.E. Hanson and G.L. Hein., ed. 2009. Compendium of Beet Diseases and Pests, Second Addition. American Phytopathological Society, St. Paul, Minn. 140 pp. Klingman, G.C., and F.M. Ashton. 1975. Weed Science Principles and Practices. Wiley Interscience, New York, N.Y. 431 pp. Shaner, D.L., ed. 2014. Herbicide Handbook. Weed Science Society of America, Champaign, Ill. 513 pp. This publication was authored by Alan Dexter, former Extension sugar beet specialist, NDSU; Jeffrey Gunsolus, Extension agronomist-weed control, University of Minnesota; and William S. Curran, Extension agronomist-weed control emeritus, Pennsylvania State University, 1994.